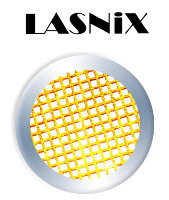 LASNIX offers since 1984 unique infrared components: free-standing metal grids to control polarization and power of laser beams up to high power. Their unique value is that - due to the missing substrate - the transmitted beam is neither offset nor deviated. Both diffractive and sub-diffractive grids are tailored for specific applications spanning the infrared-to-THz range (0.7 - 1200 µm wavelength). The proprietary LASNIX diffraction technology enables precise attenuation over multi-octave wavelength bands. Neutral density filters and multi-step attenuators handle beam powers up to 300 W c.w. while faithfully maintaining polarization and pulse dispersion. A proprietary LASNIX design enables a near perfectly transmitting linear polarizer with 40 db rejection. In the continuously variable attenuator two polarizers can be set to continuously control the transmitted beam power, and independently set its polarization orientation. A proprietary LASNIX development of a very fast power sensor up to 50 W is offered for OEM monitoring or process control. Combined with attenuation and a rotating polarizer the polarization sensor offers a compact solution to determine the polarization status (orientation, ellipticity, circularity) of even very strong beams up to 3 kW c.w. A permanently aligned, lamellar-mirror FT-IR spectrometer of minimal footprint, for monitoring infrared beam spectra over a record broad spectral region 1 - 70 µm, with reduced response even including the VIS and THz regions.